Our official Myanmar travel partner, ScapeTour, has gone live! 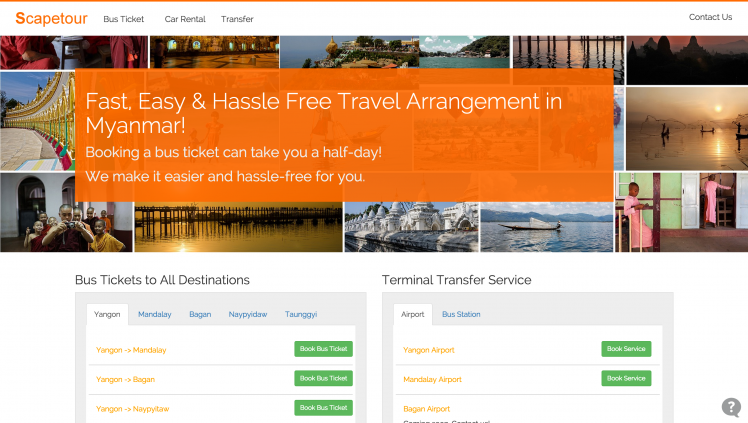 ScapeTour – Travel arrangement made easy in Myanmar! EventNook is proud to announce that ScapeTour – Travel Booking Site for Myanmar has launched! Time for some background information, ScapeTour is a start-up looking to simplify the booking process for highway express bus tickets, car rental, tour packages in Myanmar. Travellers can secure their tickets early and complete the booking process in minutes with the use of ScapeTour’s simple mobile-friendly user interface. In essence, travellers book online and ScapeTour will handle the ground work. Founded by our CEO, Kyaw Lin Oo, ScapeTour also shares the same vision of keeping things simple. This can be seen with the ticketing platform ScapeTour has used for its website which is the same as EventNook’s. As of now, ScapeTour is focusing on bus ticket bookings with a mission to make travel arrangement fast, easy and hassle-free for tourists coming to Myanmar. Here’s an article from e27 that’s been written on ScapeTour! Next Post How to add facebook page like box in the event page?